A few weeks ago I attended a meeting for PATH that brought some unexpected excitement our way. 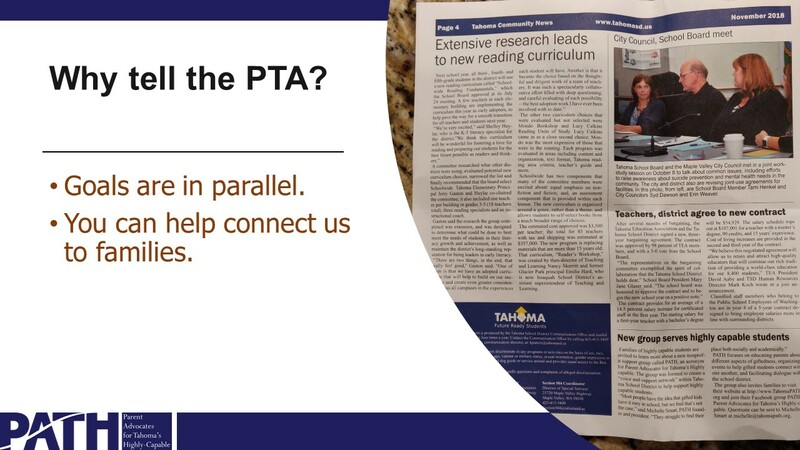 I was invited to attend the TSD PTA Roundtable meeting in December, to give them an intro to PATH. Don’t know what the PTA Roundtable is? You’re not alone! I hadn’t heard of it ‘til this past summer. I know what you're wondering, and no, there's no actual round table, though they do sit in a circle. 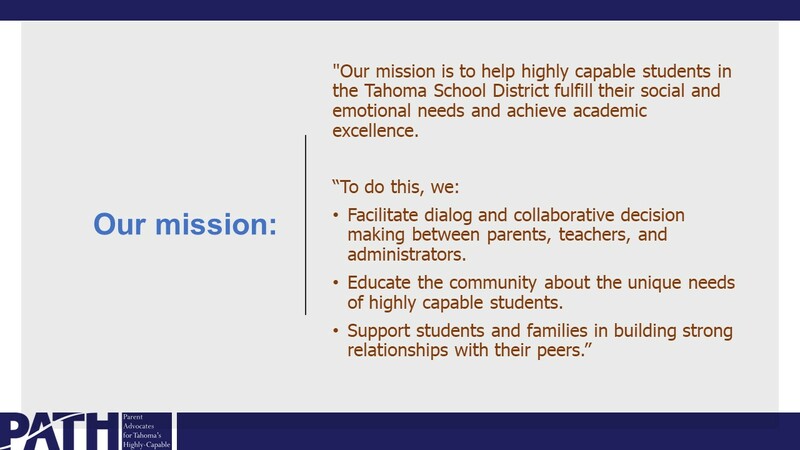 It’s a monthly meeting of all the PTA presidents in the school district, as well as the superintendent and representatives from Tahoma Education Association, Tahoma Schools Foundation, and the school board. They invited me to give a 15-minute presentation on PATH. (Confession: I was more than a little nervous!) Two PATH parents are current PTA presidents, so it was great to feel their support there. 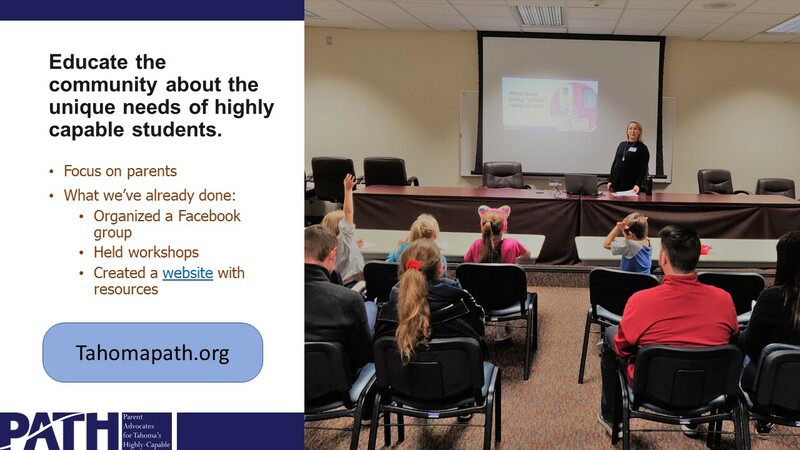 You can see my presentation slides below. 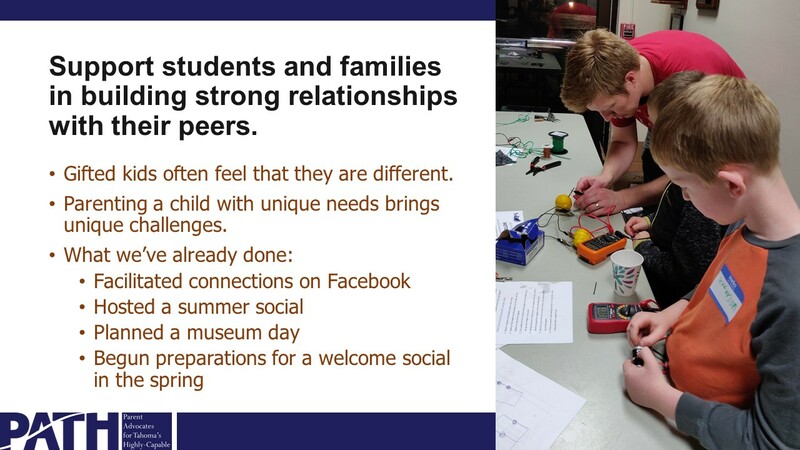 In the Q&A segment, Mary Jane Glaser of the school board shared an insightful piece of advice. 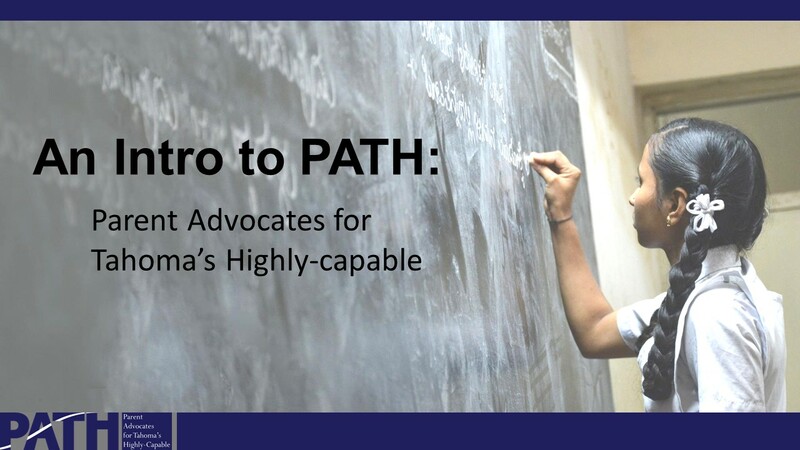 She suggested that PATH parents stay actively involved in their schools’ PTAs, so as to foster a feeling of inclusion and cooperation. 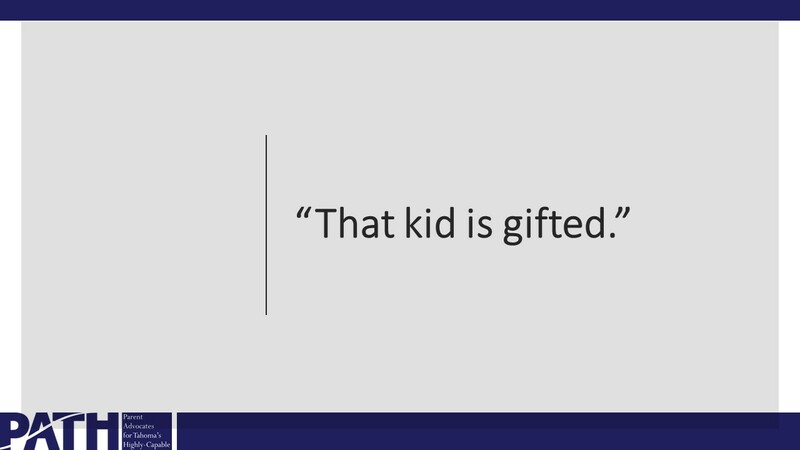 After another question, about what is being done to expand gifted services at the middle schools, Superintendent Tony Giurado asked if he could respond. He said there are two efforts currently in process to address the needs of highly capable middle school students. First, there is the oft-discussed new district-wide focus on helping teachers better understand how to recognize above-level student work. Second, Tony reported on specific efforts at the district level to explore options for expanding services at the middle level. 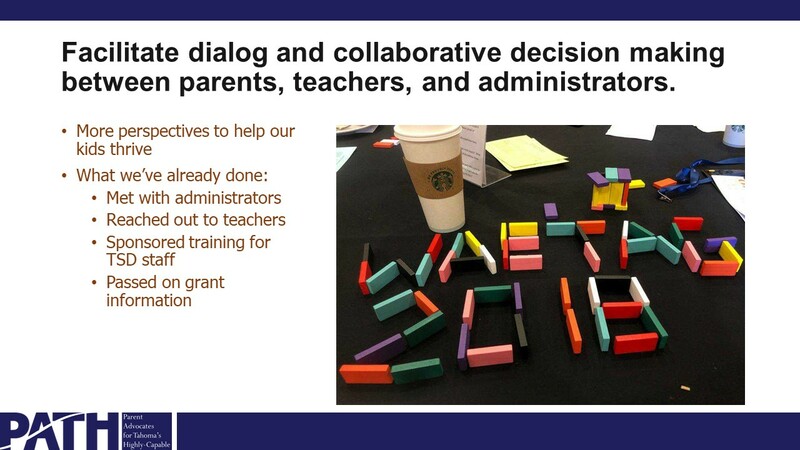 Chris Everett (administrator over highly capable) and Brigette Vannice (middle level humanities instructional coach)—both of whom PATH sent to the WAETAG conference last October—are looking at nearby districts’ gifted programs, to see what is working there. Chris and Brigette had already shared this with me, but it was still nice to hear how in the loop Tony is. 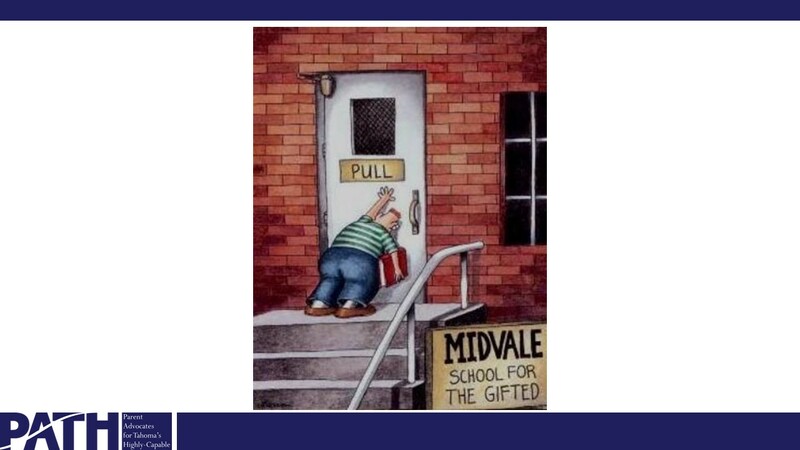 Then Tony announced some huge news: Dawn Wakeley (executive director of teaching and learning) is preparing to reach out to parents during 1st quarter 2019 to get their input on highly capable at the middle level. After administrators review the information, Tony said he expects some expansion of services to be in place for fall of 2019! I kept my cool and didn’t jump up and down squealing, but it took some effort. 😉 This is huge! And I know it’s because PATH has been letting the district know that this is what our children need. So stay tuned, folks, because big things are happening.